*This tour is limited to groups of 2 people and more. The tour starts at 8:45 from Nagano Station where your guide will be waiting for you from 8:30. He/she will take you to your tour vehicle which will take you through some scenic countryside villages until you get to Ogisawa Station. From here your journey to the top of the mountain begins. Here you can find the at max. 20 meter high snow corridor. There is so much snow fall on Mt. Tate that the road has to be “carved” open in order to let vehicles pass through. Visitors can also pass through this wall and take in the amazing height of snow in the middle of spring/summer. Your first mode of transportation after your tour vehicle drops you off at Ogisawa Station is a trolley bus running through tunnels to the other side of the mountain range to Kurobe Dam. Kurobe Dam is Japan’s tallest dam and one of the most dangerous structures ever built. Your guide will tell you the history, facts, and features of the impressive structure and lead you to the other side. Here a ride on a cable car with an elevation of 400 meters awaits you. The view from this landing station shows you the entirety of the dam complex and the surrounding mountains. Having taken in the view you will board a ropeway which is said to be the longest of its kind at 1700 meters. If you’re lucky you get to see some really gutsy skiers or snowboarders sliding down the steep mountain side. After the ropeway, only one other transfer is needed to get to the snow corridor. Get comfortable in the trolley bus to Murodo, the last and final station. Your guide will lead you along the so-called “Panoramic Route” to the snow corridor. The road leading through the snow corridor is completely inaccessible from December to mid-April because of the enormous amount of snow that comes hurling from the skies. At mid-April the snow has melted just enough so that the road can be cut open, creating walls on both sides of up to 20 meters. If you’re at the right place at the right time you can see a tour bus passing through the corridor, looking dwarfed next to the impressive height of the wall. After seeing the wall, enjoy free time for wandering through the area, exploring the museum for the official bird of the Tateyama area, the rock ptarmigan, or “thunder bird”, seeing the moutain’s onsen sources, finding the best view to enjoy lunch, etc. Once you’ve seen and done all in the area for 3 hours, meet-up with your guide and make your way down the same way you arrived. Once you get to Ogisawa, jump straight into your vehicle and drive back to Nagano where you will arrive between 18:30 and 19:00. 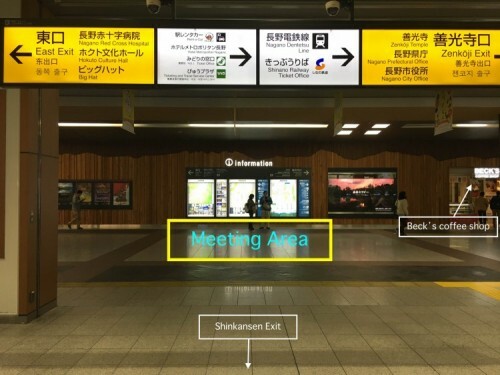 Meet-up with your guide at the Information Board across from the Shinkansen exit gates and take a seat in the tour bus (your guide will be waiting for you at the meeting point from 8:30). Arrival at Ogisawa Station, gateway to the Tateyama Alpen Route. Get off the tour bus and on the trolley bus to Kurobe Dam. At Kurobe Dam, your guide will explain about the tragedies and impressive feats of engineering that had to occur to create the structure. After you've made your way across Kurobe Dam get on a cable car to Kurobadaira, know for its lovely views over the dam and surrounding mountains. Get on the Tateyama Ropeway which at 1700 meters long, is the longest ropeway of its kind. The last leg of the journey to the snow corridor is a ride on a trolley bus for 10 minutes. Then you'll have arrived to Murodo where you can find fields and walls of snow. Your guide will lead you to the wall of snow and then give you 2.5 hours of free time to explore the area. Meet-up with your guide and start making your way back down via trolley bus, ropeway, cable car, and trolley bus. Arrival at Ogisawa Station. Your driver and vehicle will be waiting for you here to take you back to Nagano Station. Arrival at Nagano Station! Your guide will take you back to the Shinkansen gates and say his/her goodbyes to you. Infants (0-5) are free of charge. Please wear suitable shoes for walking on possibly snowy trails. Please bring sunglasses as the snow in combination with sunlight is quite blinding. The itinerary is based on the traffic conditions being optimal. We will adjust the schedule according to traffic conditions and pace of the group on the day of the tour. In case of extreme weather conditions, routes to the snow corridor might close. In such a case, the tour will be cancelled with full refund. *You can still take 07:20 – 08:43 train since JR Nagano Station isn’t big at all and there is only one Shinkansen ticket exit. The tour meet-up is just after the Shinkansen ticket exit so please come straight up to there.